That the ancient Maya produced high-quality textiles will come as little surprise to anyone who has traveled through the modern Maya world. But because few textiles are preserved from ancient times, it has been difficult to confirm that this was the case. Now researchers at the University of Rhode Island have performed a lab analysis of forty-nine samples from a tomb at Copan. The analysis showed a high degree of sophistication in the textiles’ manufacture — one had a count of 100 yarns per inch, which would be high by modern technology and consequently “speaks to the technology they had at the time for making very fine fabrics” according to textiles conservator Margaret Ordoñez. The story is at ScienceDaily. The article has a weird lead, which claims that “Very few textiles from the Mayan culture have survived.” When will people learn that the Maya culture is still very much alive? And that “Mayan” is the adjective for the language, not the culture? 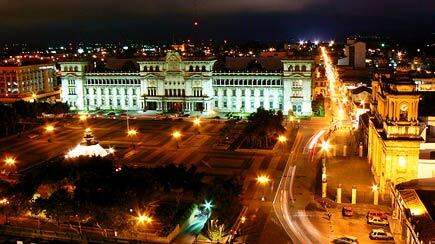 This image of the National Palace and downtown Guatemala City at night is from Oscar Mota’s photostream. According to the Munich-based daily Süddeutsche Zeitung, the man, identified as Leonardo Augustus P., claims to be a former diplomat who properly obtained the artifacts. The man, now a resident primarily of Geneva, is reportedly well-known to police dealing with smuggled art and exotic animals on several continents. He has even picked up the unflattering nickname “The Thief of the Treasures” in his native Costa Rica. On the subject of looting and theft of antiquities, although it is not about the Latin American region, I recommend an excellent recently published book, The Medici Conspiracy. Dale Pendell, author of Pharmako/Poeia, has argued that the “war on drugs” is like a religious war, intended to keep officially sanctioned drugs like alcohol and chocolate dominant. 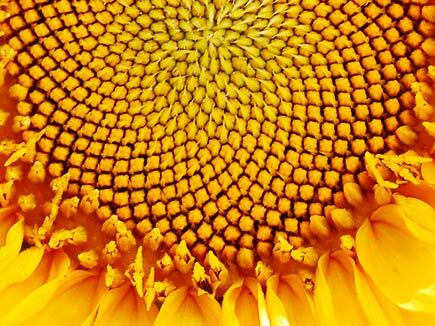 A new study, reported by Scott Norris in an article in National Geographic News, suggests that sunflowers may have been similarly suppressed by the Spanish in Mesoamerica. It has long been believed that sunflowers originated in the east-central U.S. and only spread to Mexico in recent centuries. But the new study, led by David Lentz of the University of Cincinnati, argues that sunflowers have been domesticated in Mexico for at least 2000 years, which suggests an independent origin of domestication in Mexico. This conclusion is based on plant remains discovered in Cueva del Gallo in the Mexican state of Morelos. The sunflower achenes (fruits containing seeds) from this site are larger than wild varieties, indicating domestication. They have been dated to 300 BCE. But Bruce Smith of the Smithsonian’s National Museum of Natural History in Washington, D.C., insists that “genetic research shows that all present-day domesticated sunflowers originated from a single domestication event, from wild progenitor populations in the central United States.” Smith says that if sunflowers were domesticated in Mexico there should be more remains than have been observed. Lentz responds that sunflowers were used differently in the two locations. In the U.S. they were primarily a foodstuff, but in Mexico they were mainly used for ceremonial purposes. 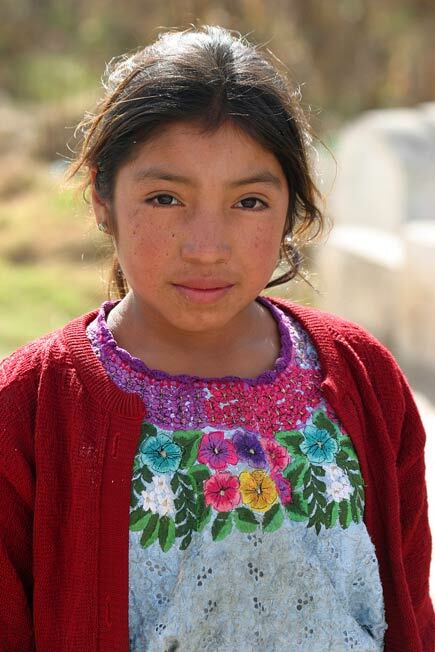 Lentz’s team interviewed indigenous people in different parts of Mexico where sunflowers are grown today. Eleven of 14 indigenous groups had unique words for “sunflower” bearing no resemblance to the Spanish word for the same species, according to the new study. Spaniards did not arrive in Mexico until the 1500s. This linguistic evidence—along with distinctive traditions associated with the plant—suggest a long history of indigenous Mexican use and not a more recent cultural borrowing, the researchers argue. They also suggest that the Spanish may have suppressed indigenous use of the sunflower because of the plant’s symbolic associations with the sun god and warfare—hence the lack of modern Mexican remains with lineages that can be traced back to ancient times. If Lentz is correct, one wonder what other ancient ceremonial plants might have been suppressed during the Conquest. 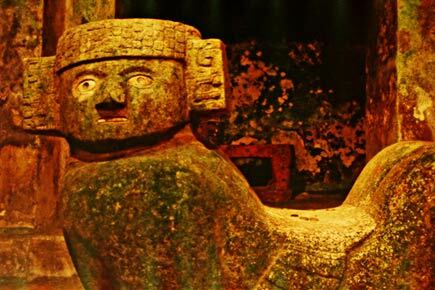 This fiery chac-mool image comes from shapeshift’s photostream. See the full book here. If figures somehow that Sun Ra would have done a tune called Mayan Temples. Far out? 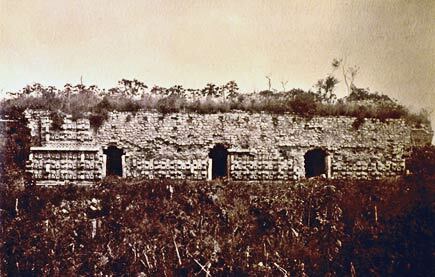 There is a great selection of early drawings and photos of the Puuc Maya region (of which the best-known and most extensively restored site is Uxmal) at a site called Architecture, Restoration, and Imaging of the Maya Cities of Uxmal, Kabah, Sayil, and Labná. The site offers both recent images and historical ones. This shot, from 1888-1891, is by Henry N. Sweet, a member of the Edward Herbert Thompson/Peabody Museum expeditions. It shows the structure known at the Codz Poop at Kabah (one of my favorite sites). The image at the top of this page is a detail from this facade, a photo I took in 2007.
and arms, and hearts, and hands, and arrows . . .
Geographer Barbara Williams and mathematician Maria del Carmen Jorge y Jorge have, after three decades of labor, deciphered an Aztec code used to calculate the areas of land plots. The pages of the books are filled with tiny property maps. For each plot, there are two drawings — one showing the lengths of the sides and another showing the area. The measurements are represented by seven symbols: lines, dots, arrows, hearts, hands, arms and bones. Each map also includes the name of the property owner and the soil type. Researchers already knew what each map represented and the value of some of the measurements. A line, for example, was the standard unit of length, which was known as a tlalquahuitl, or rod, and in modern units would measure a little more than 8 feet. 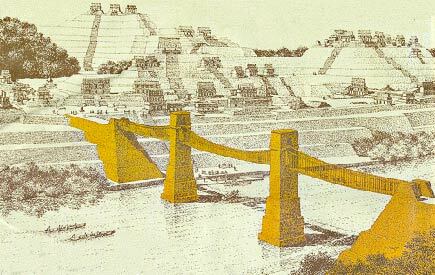 When the researchers knew the values of the units in roughly rectangular plots, they could easily follow the logic of the Aztecs and reproduce their calculations by multiplying lengths and widths. But they were stymied in calculating many plots because they didn’t know the value of the units. The breakthrough came when Jorge y Jorge, a professor at the National Autonomous University of Mexico, found that the values of some areas were prime numbers. So now we know, a hand equaled 3/5 of a rod, an arrow was 1/2 , a heart was 2/5 , an arm was 1/3 , and a bone was 1/5. But I would like to know more about how the Aztecs classified soil types. 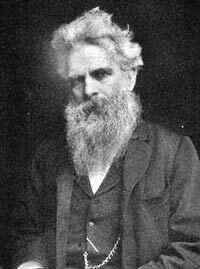 A reader named “Yes” correctly identified the photographer of this week’s photos as Eadweard Muybridge (1830-1904). 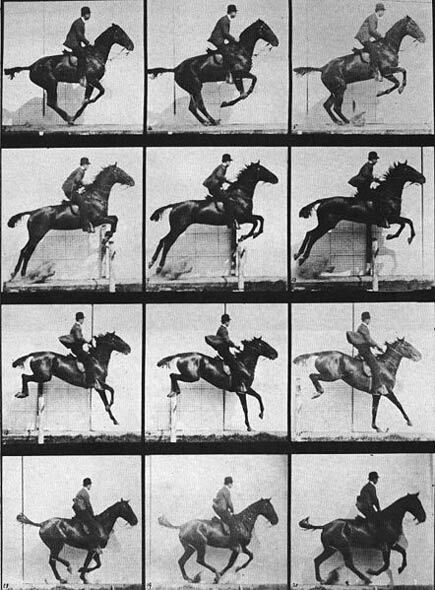 Muybridge was born in England and emigrated to the U.S. in 1851. 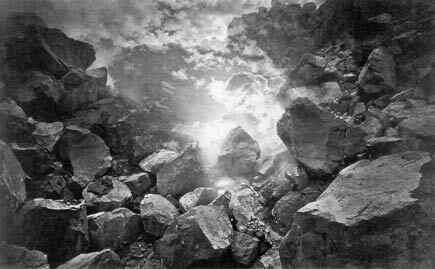 While he would become best known for his motions studies such as yesterday’s jumping horse, I think he first won fame for his monumental photographs of Yosemite Valley. But in San Francisco he became involved in a scandal surrounding the murder of his wife’s lover, and under the circumstances he thought it prudent to transpose himself for a time to Guatemala. In Guatemala, his documentary photographs of work on coffee plantations — such as Wednesday’s photo, which shows coffee workers on a plantation in San Isidro — were important recordings of an economy in the throes of radical, and painful, transformation. 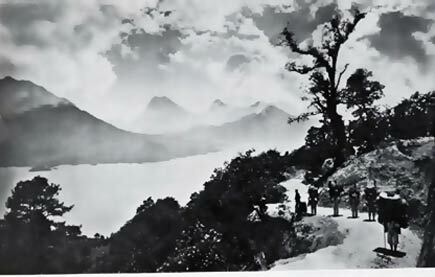 But Muybridge also did some more conventional travel photography during his time in Guatemala (1875). Tuesday’s photo shows a view of Lake Atitlan, while we began on Monday with a photograph of Volcan Quetzaltenango. Okay, here’s the fourth and final clue. This picture was not taken in Guatemala, but surely it will reveal the photographer featured in this week’s previous posts. Here’s another image by our mystery photographer (see also the past two days’ posts). What’s going on here? (Hint: the picture documents a subject for which the photographer is well known.) Who is he? What is the approximate date of the photo? Come, come, I know I have some readers. Surely someone can guess the famous photographer of yesterday’s image. Okay, maybe this will help. Here’s another photo by the same lensman. Who is it? What is it? When was it? Someone has to know the answer! 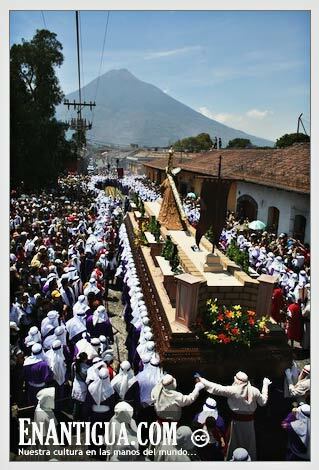 Here’s an image from Guatemala. Can anyone guess the subject, photographer, or approximate date the picture was taken? 112 more like this at En Antigua. 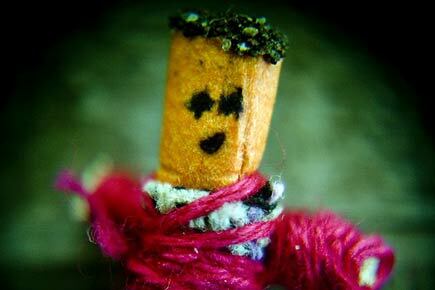 Worry people are small, rather crude (but charming) dolls, usually sold in batches of several in a bag or box. As far as I know they are particular to the Maya of highland Guatemala. Children put them under their pillows at night as a sleep aid. Tradition — or the vendors of the dolls — has it that one confesses one’s worry to the doll before putting it under the pillow. Then by morning the worry people will have taken that worry away. The image is from dickuhne’s photostream. Two videos via Carpe Diem, the blog of Luis Figueroa. Yucatan Living has a very interesting post detailing the care Working Gringa got for a dog bite. The short version: she received excellent professional care for less than $50. Here in San Francisco the same care would probably cost more than 20 times as much. 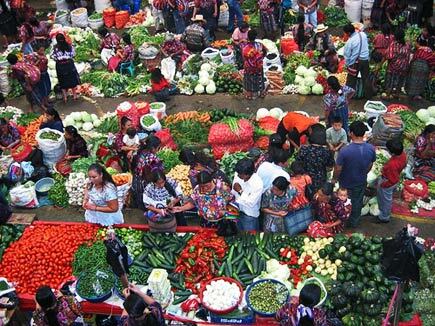 Chichicastenango market, from gepiblu’s photostream. Read about the nominees and vote for your favorite at Yucatan Living. The Clinton campaign has its own music video aimed at Texas Latino voters. The have logged in with the cumbia Hillary Hillary Clinton. I don’t think it’s as catchy as Obama’s mariachi Viva Obama. Maria Felix epitomizes the glamor of the classic Mexican cinema. Her fame is linked with that of the great Veracruz composer and pianist Agustin Lara. In this homage to Maria Felix by 2somos2 the music has the flavor of Agustin Lara, but it doesn’t sound like his voice singing. 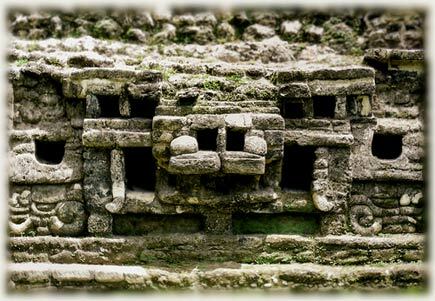 According to joiseyshowaa, from whose photoset this image of an architectural element at the Maya site of Lamanai in western Belize is is taken, the decorative pattern represents a jaguar. The Maya admired the jaguar, whose habitat is tropical jungles, for his fearsome appearance and roar, and his stealth and prowess as a hunter and fisher. In Mesoamerica jaguars were associated with shamans, who were thought to change into the beasts during rituals. Shamans and priest sometimes carried jaguar hides, wore jaguar clothing, or adorned themselves with necklaces made of jaguar teeth. Jaguar gods were associated with night (or, paradoxically, the sun), caves, the underworld, and hunting. Belief in the terrifying were-jaguar — the product of a jaguar-human union — goes back to the Olmecs, but the cult of the jaguar reached its peak with the Maya — as is logical, since the Maya and the jaguar shared the same habitat. Jaguars were sometimes sacrificed in rituals. 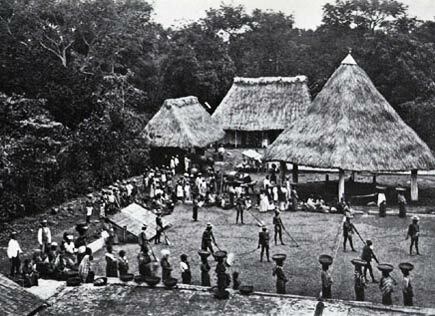 At Copan, sixteen jaguars were sacrificed with the city state’s 16th ruler assumed the throne. 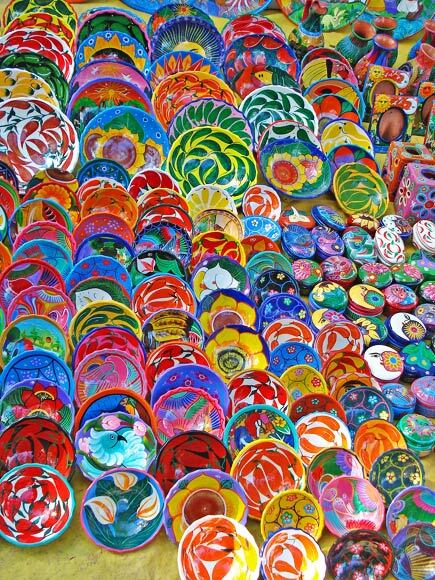 Anyone who has lived in the Maya world for any time at all knows that the Maya are magicians with color. One of puzzlements of the historical Maya has been how they created a blue color that was more resistant to fading than most natural pigments. The historical Maya used this color on ceramics and, because it recalled the rain god Chac, in their sacrifices. It has been known that two of the ingredients were indigo plant extract and a clay called palygorskite. 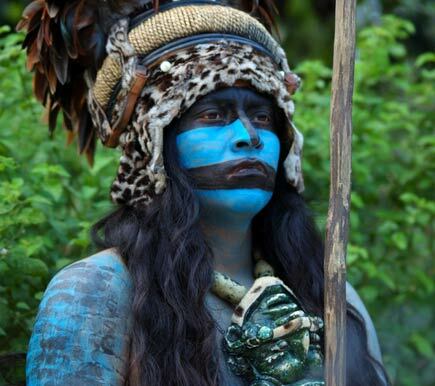 But “Nobody has ever really figured out how those two key ingredients were fused into a very stable pigment,” according to Gary Feinman, curator of anthropology at the Field Museum in Chicago. Now Feinman, together with Dean E. Arnold, professor of anthropology at Wheaton College, believe they have figured out the secret of the ancient Maya concoction. Jonathan Dunham was working as a substitute teacher in the Portland, Oregon, public schools when, a couple of years ago, he just started walking. He walked south to Texas, crossing the border at Tamaulipas. 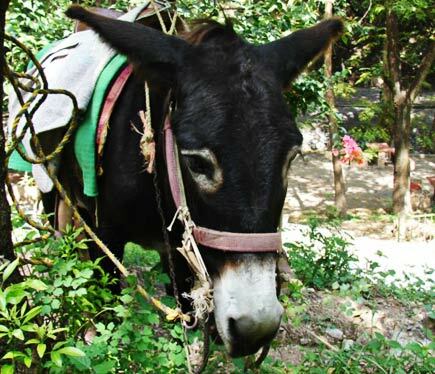 He stopped there long enough to do chores on a family farm; when he decided it was time to resume walking, his host family saw him off with a burro to help him with his load. To Mr. Dunham Mexico and Venuzuela seemed the most generous countries he has journeyed through. Read the full story at Mexico Premiere.